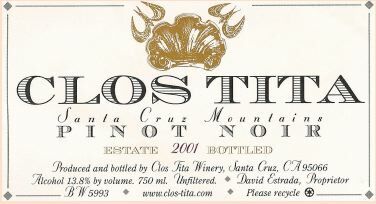 David and Britta Estrada have a one-acre estate vineyard (700 vines) planted in 1990 at 900 feet in the Scott’s Valley region of the Santa Cruz Mountains. The vineyard is worked entirely by hand, and every vine is pruned by David, who is also the winemaker and cellar master. As a practicing dentist, from September to December he has purple fingers under his gloves in the office. The wines show a unique and personalized expression of the mountain terroir. The vines are short, closely spaced, and dry farmed. Production is tiny, 75-150 cases of Estate Pinot Noir and a couple hundred cases of a Pinot Noir Cuvee from purchased Santa Cruz Mountain grapes. The Estate Pinot Noir is aged for two years in 75% new French oak. I had the opportunity to taste both of the latest releases at the Pinot Cruz tasting and also at my home. Wines are sold at the winery. 831-439-9235.